I will admit that I was a in two minds about reading Forbidden by Lauren Smith. Not because of the topic (more on that shortly) but because, although I love Lauren Smith's writing, when I read one of her novellas, which this is, I am always left wanting more. To make matters even worse, this is the first of three books in a series, not only will I be left wanting more, but there will be more coming, just not for another couple of months. My plan was to wait until the second and third books in the series were out and then read them all together. But I'd pre-ordered it and once it arrived on my kindle, I'm afraid I couldn't resist. Kat, is an American student studying at Cambridge as her father has recently moved to London for work and she wants to be near to him. She meets Tristan Kingsley, the future Earl of Pembroke. There is a burning chemistry between them and despite Kat's innocence and inexperience, things get very hot, pretty quickly. There is one slight problem, Kat's father has met someone in London, someone who he's fallen for pretty hard and is planning on marrying, someone who happens to be Tristan's mother. I know a lot of people are put off by the idea of a step brother/sister relationship, but I don't think that really counts in this case, they've not been raised together and there is no real connection there, other than the marriage of their parents. So while it might not be everyone's cup of tea, personally I don't think that there's anything really distasteful about this. What I really enjoyed about this (apart from the steamy, growing romance, which you all know is a bit of a guilty pleasure of mine, at least when well written) is that although this is a novella, being part one of three, there was plenty of room for the story to grow and develop. I enjoyed the growing blossoming between the two and the connection that they seem to instinctively share. My only slight reservations were that I don't really fully get this fascination that many American authors have with Earls and Dukes and the like. Yes he's got a title, so what?! But that just might be my British working class roots coming through? Tall dark and handsome, yes, that I do get, of course. 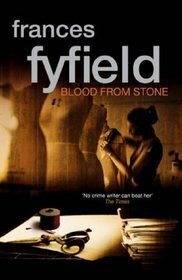 I was interested to read Blood from Stone by Frances Fyfield when it was chosen as book of the month, for a crime novel reading group that I'm part of. Fyfield is not an author that I have come across before, but the premise for the novel sounded interesting. The story opens with barrister Marianne Shearer 'winning' her latest case, although not perhaps in the way that her client would have liked. Rather than having him found not guilty, there was simply not the evidence to proceed. Shortly afterwards she jumps from a hotel window, killing herself, and leaving her colleague, Peter Friel to find out what has happened and why. As the story progresses we find out more about her final case and the impact it had on those involved in it. Peter discovers more about Marianne and her life, than he ever suspected before. He also meets Henrietta, the sister of the main complainant in this last trial. It soon becomes clear that there is more going on here than was first apparent and that Marianne has very carefully and cleverly set everything up to be revealed as he looks into her life and what she has left behind. One of the real joys of this book is the descriptions of vintage clothing. Marianne was, in her other 'hidden' life, a lover of fine clothing and had an immense and expensive collection. Henrietta (Hen) works as a dry-cleaner and preserver of vintage clothing, with work rooms where she mends and creates new pieces from the old. The descriptions of these items is fascinating, and it's easy to picture these beautiful items. (Just out of interest, should you read the book, the cape at the V&A, which is described as being similar to the skirt that features is this one.) This lively description of beautiful outfits and dresses really adds to the depth of the book. One of the other lovely parts of the story are the characters of Hen and Peter, to begin with I wasn't sure where the book was going, or if I actually liked any of the people within it. But I quickly warmed towards these two and their developing relationship. I'm not sure that I'll be in a rush to read more of her works, but I certainly enjoyed it, although it did take me a few chapters to get into it to begin with. I love the school holidays, maybe not quite as much as I did when I was actually at school, but there's no doubt that they are still great. Not having to get up early every morning, no lunch boxes to pack,(ugh, lunch boxes) time to spend with the kids. It's not all fun and games, having children at home all day can lead to craziness, fights and cries of 'but I'm bored!' but over all I love it. Apart from one slight problem that is. You see, back in the days when it was me who was on holiday from school, I got a break. There was no homework to get finished, I didn't have other things that I had to get done, even in the days when I had a part time job, it was only a few extra hours in return for extra spending money while I was off. No fuss, no pressure. These days though, children being home from school means more work. This is where working from home becomes a struggle. Somehow I've got to fit in all of the things that I have got to get done, while still making sure that I'm not ignoring the children and finding fun things for them to do. I don't want to park them in front of the TV and hope for the best while I work my way through my to-do list. Fortunately they are quite good at entertaining themselves, and each other for that matter, but I don't want them to have to just rely on that, I want to be part of the school holidays fun to. Sadly though, there's a pile of work to get through that just isn't getting any smaller. I'll just have to try and juggle things until they're back and school and then get back on top of it all again then. Hopefully. I've had this book sitting on my to be read shelf (aka the pile of books on my beside table) for about a year now. For some reason I was finding it hard to pick up and read. Not that I knew anything about it, I'd been bought it for Christmas last year, and hadn't even heard of it before that. The problem was, that I am a historian by training, that is, I studied history at University. More to the point, this is more or less 'my' period. I'm always hesitant to start reading fiction set in the past, more often than not, it's so far removed from anything that I've studied that I can't cope with it. Having said all that, it's now some time, (we don't need to go into how long) since I was at university, and while I still retain an interest, my knowledge isn't what it was, I've moved on from the days where I struggled to even watch TV history programmes. 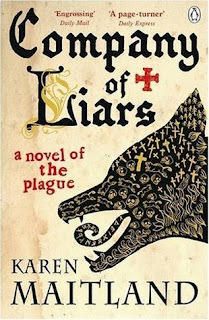 In any case, whatever my fears, I picked up Company of Liars and started to read a week or so ago. Once I'd got started I was hooked, I loved the unfolding of the story and the development of the characters, all with their secrets to hide and their past to conceal. Although the setting was 1348, in many ways it was more a mystery or a thriller than a straight historical novel. There were a few aspects that didn't really fit, for me, with the period, but taking it as a dark novel, rather than something that was strictly historically accurate, made that easier to cope with. I have noticed that other people have complained about the ending, obviously I won't go into details of that here, but I think that I should comment on it. Was it what I was expecting? Not really. Was it the right ending? I'm not convinced. It seemed a little forced, to be honest almost as if she reached the end and suddenly decided that she couldn't just fade the story out. On the other hand, let's not forget that the whole theme of this book was liars and the lies that they tell, perhaps we should take everything that we're told with a pinch of salt. If you're interested in a quite dark, set in the past thriller, and aren't too concerned about historical accuracy (although much of this does feel fairly authentic, just not all of it) and a slightly unexpected ending doesn't distress you too much, then you'd do well to give it a go. 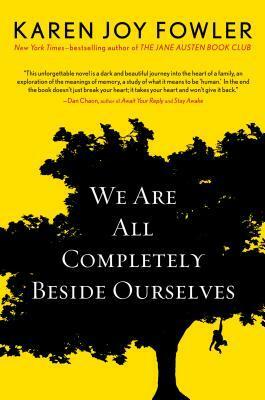 I came into this knowing nothing at all about We are all completely beside ourselves , by Karen Joy Fowler. It is often a good way to start with a book so that any unexpected twists or turns are unexpected. Having read a few reviews, I've discovered that many people don't go into this particular book like this, and already know about something that is revealed less than a quarter of the way in. I'm not going to actually go into what this thing is, if you don't already know, then it's probably better if you go into the book blind, as I did. Having said that, I'm not sure that it would ruin the book if you don't already know. Indeed, I was almost tempted to go back and read that first section again, knowing what I now know, perhaps another time. This does leave me with a slight issue, how do I review a book without discussing one of the main themes and ideas? Vaguely I suppose. I did really like this book, it addressed many ideas of family, relationships between children and parents, brothers and sisters. It even questioned what actually makes someone a brother or a sister. There's a lot more going on here, though, it looks at the impact your childhood has on you. How families hide things and don't talk about things and how this might affect the way that things are remembered. I'm struggling here a bit, as I said before, I don't want to give too much away about this, but that makes it really hard to actually talk about any of it. I think this might be a bit of a short review: I enjoyed it. It was thought provoking, an interesting read. 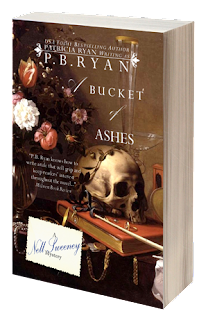 I think I mentioned that it wouldn't be long until I posted my review of a Bucket of Ashes, the sixth and final Nell Sweeney mystery. Once I'd finished Murder in the North End, I couldn't help but start a Bucket of Ashes straight away. After being left with a conclusion of sorts to the Nell and Will relationship, which of course was no conclusion at all, and left us wondering what was finally going to happen with them, I of course had to go on and find out. In many ways, this book, being the last is really about tying up loose ends and finishing things off. It does seem quite fitting that it should be set at the Cape Cod house where we were first introduced to Nell and the Hewitt family. It was also the place where Nell's charge, Grace, was born and her link with the family created. In a Bucket of Ashes, Nell finds herself once more in the company of her previous mentor, Dr Greaves, who's own situation has now changed. I'll try again not to give too much away, but in some ways Dr Greaves presence is really only there to add and extra dimension to our Will and Nell story so that things aren't resolved too quickly. The mystery this time is less of a mystery to solve, than Nell learning the fate of her only surviving relative, Jamie. Although there is some intrigue to this, it's less about Nell finding out what has happened, rather than an investigation as such. The first time I read the series, I remember being a bit disappointed with a Bucket of Ashes. Not because the story itself wasn't good, and certainly not because I wasn't happy with the ending. I just felt that it was over a little too quickly and of course everything was neatly wrapped up. Having re-read it twice though, I think my complaints were far more to do with the fact that I read it too quickly and didn't want it to be over. Second and third time around I really enjoyed it much, much more. Let's be honest though, I'm always sorry to see a series I love come to the end. Every so often Facebook statuses pop up about book swaps or book shares. All you need to do is send off one book, pass the details on to your friends, and then in a few weeks you'll magically get lots of books in return. Except of course, you won't, because these things never work. I won't go into the details of why not, but if you want to know more there are heaps of explanations around, like this one. But what about a book share that actually will work, won't cost you much (if anything) and will introduce you to some new books and authors. Interested? 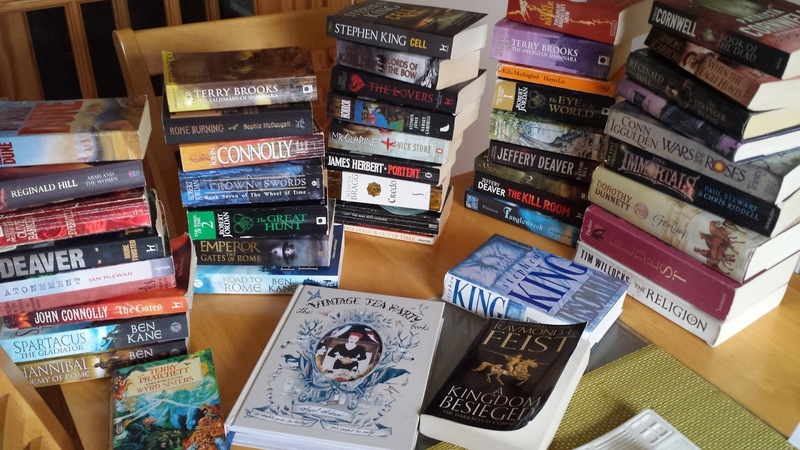 My book share idea is simple, all you need are a group of people who want to take part. You can have as many or as few as you like, but 12 is a good number to work with. You don't have to find them all yourself, you could ask one person and ask them to find someone themselves and so on until you have your 12 and then take it from there. Choose your participants, 12 works well if you want to do it over a year, 6 if over six months and so on. Each person picks a book that they have enjoyed. If you choose a book you already own, then it won't cost you anything, or you can buy a copy of the book (it doesn't matter if it's second hand). The book you choose can be any genre of book you like, just so long as you enjoyed it. Choosing something less well known can make things more interesting as people are less likely to have read it. It might be a good idea to choose people with different interests so that you get a wide range of books, or decide that everyone needs to pick from the same genre, so have a murder mystery book swap, or romance book swap for example. Once your book is selected, pass it to the second person in your group, they pass their book to the third and so on, all down the chain. If there are 12 people in your group then you should receive your book from person 12. You then have a month to read your book, which means those who don't read much have time to get through it, but people who read lots can read other things while they wait for their next book. On a set date, when the month is up, you pass the book you have been reading onto person two, they pass the book they've been reading onto person three and so on. This continues until the end of the challenge, when you should get the book you picked back. You've then had a year of introducing a book you love to 11 other people, and discovering 11 other new books. Other than the cost of your initial book, there isn't really any other cost to this. If you want, you could post the book to the next person in the chain. This way you can make it an international book swap if you want. Or you can find someone local and pass it on in person. It doesn't actually have to cost you anything and you get your own book back at the end of it. There are no rules to the book swap as such, but it might be worth having one person to oversee it all and make sure that everyone is sending their books on when they should. You don't need to do anything but read each book that comes along each month. If you want to take things a bit further though, you could set up a group on Facebook or somewhere similar. Each book could have a 'file' and after a person has read it, they could comment with their thoughts. Another idea would be put a sheet or two of paper in the back of each book, for people to add their thoughts too once they've read their book. When you get your book back, you'll see what everyone else thought of it. 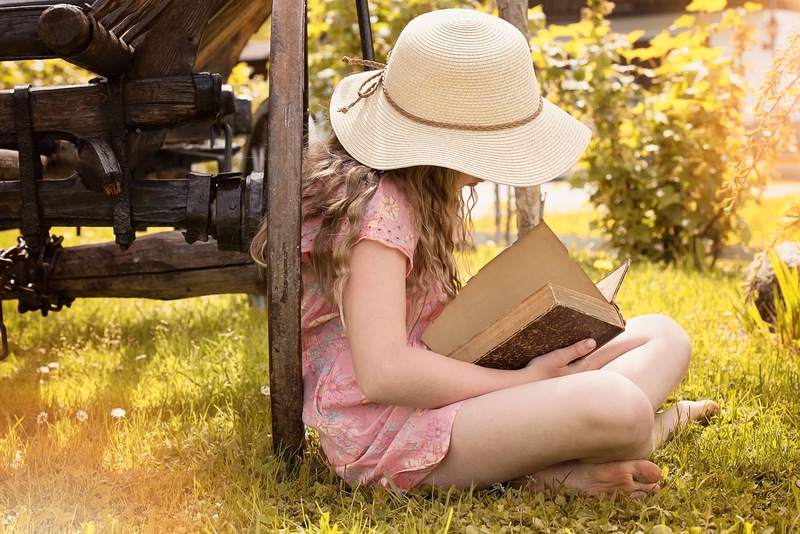 I'd love to hear how you get on with the book share idea, let me know in the comments section. If you want your friends to join in, then feel free to share this post around to tell them all about it. Have fun. 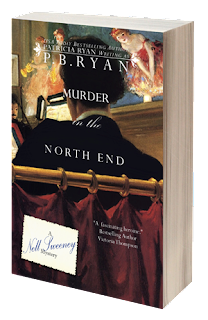 I'm beginning to get towards the end of the Nell Sweeney mysteries now, Murder in the North End is book five, of the six book series. There has been a follow on book promised for a couple of years now, but at the moment certainly, there are just the six. It's always a bit sad when you know that you're getting close to the end of a series, especially one like this that I love so much, (even if I have read them all before). This time we find Nell about to leave for Cape Cod with the rest of the Hewitt household, but on finding out that her friend, detective Colin Cook, is in trouble and wanted for murder, she decides to stay behind and try and help him. Left alone in the big Hewitt house, Nell feels a little exposed and with the ex-detective Skinner, now a lowly constable, certainly feeling anything but friendly towards her, Nell is probably putting herself in quite a bit of danger. It's some time since she last saw Will, after their parting at the end of the last book, so he isn't even there to look after her. I don't want to give too much away here, but as this IS a Nell and Will book, so I would hope that I'm not spoiling things too much by saying that it isn't too long before he appears. The relationship that has been simmering away beneath the surface for so long in the previous books is as present and unresolved as ever, (especially after the events of the last book,) but you can't help but feel that we are about to reach a conclusion with it soon. The mystery itself, is again pretty sound, I hadn't solved it the first time around before it was revealed, but it all worked without stretching things. If you've read my previous reviews, you'll know that I love this series though, so it's hardly surprising that I'd think that. One book left to go, which, I have to admit, will be following shortly, because although I've managed to spread the re-reading of these out a bit, this time round, I always end up moving straight onto the final book after reading Murder in the North End.